Boasting more than four decades of engineering excellence, Turmec Engineering in County Meath is a leading OEM that specialises in designing, manufacturing and installing cutting-edge recycling / waste management facilities across Ireland and the UK. We met up with marketing manager Brian Thornton to find out more. Established in the Gaeltacht region of Rathcairn, County Meath in 1974, Turmec Teoranta is a family business, which has been fronted by the pioneering Joe Coffey since 1999. Originally specialising in general engineering the company has evolved to design and manufacture market-leading facilities for customers in the recycling industry. Ensuring efficient separation, maximum throughput and minimal labour input, their bespoke plant and machinery is manufactured in a purpose-built 46,000 sq ft facility to exact customer requirements and assembled and tested to BSEN ISO 9001 2000 standards. Robust design and construction guarantee minimal maintenance and therefore little or no downtime. Through continual investment in technology, equipment and personnel, Turmec has built a reputation for quality, service and flexibility. Turmec is committed to continual improvement and achieving the highest standards in all areas of its business, from Quality Control to Health & Safety; this commitment is reflected in its wide customer base, ranging from small businesses to larger waste companies and semi-state bodies. High-profile customers include Google, the ESB, Born na Mona, Tara Mines, etc. As a progressive Original Equipment Manufacturer, Turmec embraces the challenge of developing new innovative projects. Their experienced design team is both progressive and creative and through close liaison with the customer, a cost-effective and reliable end product is achieved. Every time. All management, design, engineering, installation and commissioning personnel are highly-trained and vastly-experienced, having accumulated thousands of hours of experience in all aspects of the engineering and recycling industries. Through the experience gained in general engineering, Turmec have become leading experts in the design and manufacture of recycling equipment, which they design, manufacture, install and commission, whilst also training the customer fully in how to gain optimal benefits from the equipment as part of their comprehensive back-up service. Renowned for innovation engineering solutions, Turmec’s solid reputation covers key areas including general engineering, contract engineering and complete turnkey recycling solutions. The majority of work secured is repeat business from satisfied customers. Turmec’s dedicated in-house team boasts the experience of designing some of the largest and most complex end-to-end recycling solutions in the UK and Ireland. Be it a greenfield build or a space-constrained upgrade project, they can come up with the optimal solutions for all requirements. 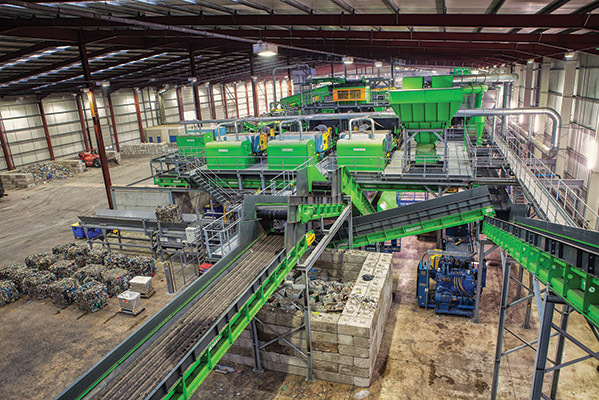 Turmec has developed an outstanding reputation for excellence at the very forefront of the recycling facility manufacturing sector. They work for a who’s who of recycling and waste management companies, including being the main plant provider and engineering consultant for Powerday, who operate the largest and most-efficient recycling facilities in southern England. The engineering sector was lagging in Ireland in the early 2000s and that was when Joe Coffey took the decision to shift the company’s focus into a niche market where few others were focussed. It was an inspired move as Turmec Engineering has since gone from strength to strength, evolving into the recycling industry’s plant designer, manufacturer and installer of choice. Today, gainful full-time employment is generated for a team of 85 –110 (as well as work for up to 60 subcontractors) at the company’s 14-acre state-of-the-art manufacturing facility in Rathcairn, where the most sophisticated and user-friendly recycling machinery is manufactured for export not just to the UK but further afield. For example, Turmec recycling plants can also be found in Spain, Canada, the United States and Australia. Turmec possesses the flexibility, versatility and engineering excellence to turn their hands to literally any application –from providing engineering solutions to nearby Tara Mines (the largest zinc mine in Europe) to designing and engineering storage racks for Google and Facebook to manufacturing sea buoys, peat harvesters ash wagons and solutions for the ESB. Regarding scope for diversification and growth in the future, Brian adds: “There is always room for refinement and the exploration of new markets and, to this end, we have already started research into recycling ash, tyres and glass. But the back-up and support services and assisting with operation of the plant are also areas where we can grow.